Shred Guitar Riffs, Pantera "Revolution Is My Name" - Free Pantera Shred Guitar Riffs! This free Shred Guitar Riff is "Revolution Is My Name" by Pantera. This riff starts at about 2:43 seconds. It is one of the easier pantera riffs to play. Start this shred guitar riff by picking some single notes that follow the G Minor Pentatonic scale. Follow those with some power chords. 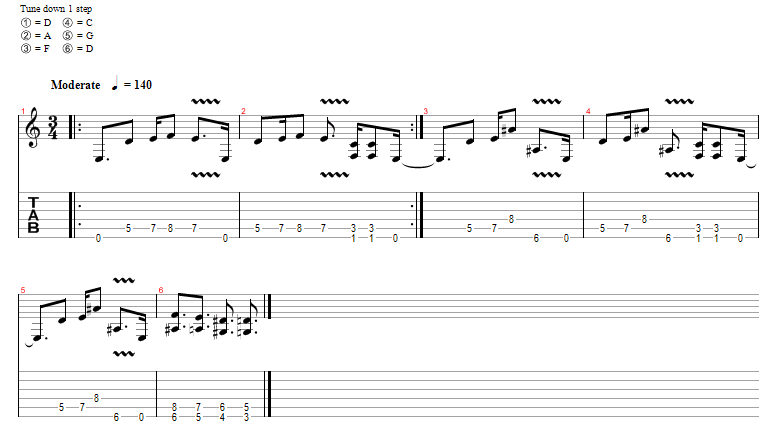 Remember to tune your guitar down 1 step to play this shred guitar riff below. If you need a refresher then check out the tuning page to get your guitar in tune and ready to play. With this lesson you can learn to play "Revolution Is My Name" by Pantera. Pantera Shred Guitar Riff - "Revolution Is My Name"